Living Space: 12000 sq. ft. Surrounded by the rain forest, at the top of the hill of Manuel Antonio, This unique property is a unique jungle resort that offers truly amazing opportunities for adventure-sport travelers and relaxation seekers alike. The iconic property offers not only the opportunity of being in the jungle, but also beautiful ocean views and easy access to some of Costa Rica’s most beautiful beaches, restaurants, spas, and is centrally located for easy access to all the activities and tours offered in the area. The property is one of the founding hotels in the Manuel Antonio area, offering a variety of comfortable 3-star accommodations and amenities. Guests can choose from our 7 free-standing bungalows, 10 deluxe and premium deluxe hotel rooms and the owners also have a luxury rental house in the area, Casa Sarita which is being offered for purchase with the hotel or independently at an amazing value. The hotel’s ample grounds, which are more than 1.5 acres in size and which border a wildlife reserve, allow hotel visitors to experience Costa Rica’s exotic wildlife without ever having to leave the resort property if they so choose. 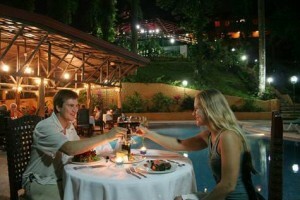 Two restaurants located on the grounds provide various international and local dishes. The sports bar & grill and the area’s ONLY active Casino are open late nightly and make this one of the most unique hospitality and Casino opportunities on the Pacific coast. The Bistro serves breakfast, lunch, and dinner consisting of favorite Italian, international, and local dishes, as well as homemade brick-oven pizzas in a beautiful and relaxed poolside setting perfect for animal and people watching. The hotel has an impeccable maintenance record, robust and well trained administrative team and sophisticated online booking programs, accounting, inventory and reporting. This is an ideal opportunity for a hotel and Casino operator, as with the new Marina Pez Vela the opportunities for growth in the gaming income is truly exponentially. There is a lot of public road frontage on the main road leading to Manuel Antonio National park which is getting over one million tourist per year and the hotel and casino are walking distance from all the areas iconic activities, restaurants and is the epicenter for Manuel Antonio nightlife with its sports bar and Casino.